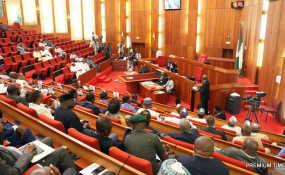 Despite the tumultuous session, Senate yesterday condemned the alleged militarisation of the electoral process and the inconsistent application of Electoral Laws by the Independent National Electoral Commission (INEC) in the country. The upper chamber averred that if the trend of using extreme military force witnessed in the 2019 general elections is not halted, it is capable of posing serious threats to democracy or its survival in the country. The senate however directed its committee on INEC to carry out thorough investigation on all perceived inconsistent application of Electoral Laws by the electoral body in the general elections. This is just as it urged President Muhammadu Buhari to give assent to the recent Amendment to the Electoral Act to ensure a level playing field and adoption of equal standards in our national elections for a strong and peaceful democracy in Nigeria. It also urged INEC to in future elections; ensure unrestricted and consistent application of all Electoral Laws without bias to a candidate or a party. These were fallouts of a motion moved to that effect by Senator Dino Melaye ( PDP Kogi West) and co-sponsored by seven other senators on the platform of the Peoples Democratic Party ( PDP) . Senator Melaye had in his lead debate on the motion titled: " The militarisation of the Nigerian Electoral Process and the inconsistent application of Electoral Laws by the Independent National Electoral Commission ( INEC)", submitted that the alleged ugly trend witnessed in the 2019 general elections must not be allowed to happen in future elections. He particularly cited alleged cases of such ugly incidences of militarisation of electoral process in Kogi and Rivers states. According to him, while the Aide de Camp ( ADC) to the Kogi State governor , Alhaji Yahaya Bello, held members of opposition parties to ransom during the elections, the military, particularly men of the Nigerian Army did same to voters and INEC officers in Rivers State. "This extreme militarisation of a democratic electoral process, and the inconsistent application of Electoral Laws by INEC in matters of national elections pose serious threats to our democracy, and has security implications that must be nipped in the bud. Persuaded that the nation is on the edge of a precipice, and our democracy can be saved for future posterity, if only we can build strong institutions that can operate within established laws, and with our military forces restricted to their traditional roles of defending the nation", he said. Though the Senate Leader, Ahmed Lawan ( APC Yobe North) , seconded the motion on the grounds of required legislative intervention in strengthening the nation's electoral process , but trouble started when the Senate Minority Leader, Biodun Olujimi ( PDP Ekiti South), made her contributions. Debate on the motion assumed partisan dimension when Olujimi in her contributions alleged that rigging was legalised in the elections and votes buying was the order of the day. Angered by her submission , the senate leader , raised order 53(4) of the senate's standing rules for the Senate President, Bukola Saraki to call her to order. Even efforts made by the Senate President , Bukola Saraki to make senators debate the motion dispassionately and not along partisan lines proved abortive which made him to hurriedly put the four prayers on the motion to voice votes . Partisan colouration of debates on the motion was further demonstrated by both the PDP and the APC senators during the voice voting as the PDP senators shouted ayes, to all the four prayers while their APC counterparts , shouted nay, with the Senate President ruling in favour of the ayes. "I feel very sad that I was denied opportunity to make contribution to a motion in which wide allegations on what did not happen were made against the military in Rivers State by a senator from another state," he said.